Administrative Judge Daniel F. Solis administers oath of office to Desmond L. Cooks. 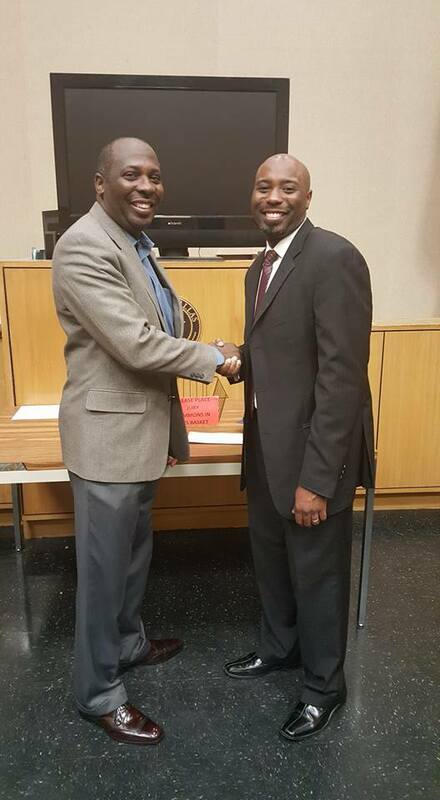 DUNCANVILLE— Judge Desmond L. Cooks, 36, was recently named a Municipal Judge for the City of Dallas. He talked about being an attorney as early as the second grade,” Former Duncanville City Council member Mark Cooks recalled about his son. Actually, the newly named judge had originally considered joining law enforcement after his stint in the US Navy. However, Judge Cooks decided, he could make more of an impact in the courtroom. “Plus he would need to learn the same policies anyway,” Cooks added. With a desire to be a trial lawyer and practice in the courtroom as much as possible. Cooks said it was a natural progression for his son to set his sights on becoming a judge. “It also could have been all the Perry Mason shows I had him watching with me,” he joked. 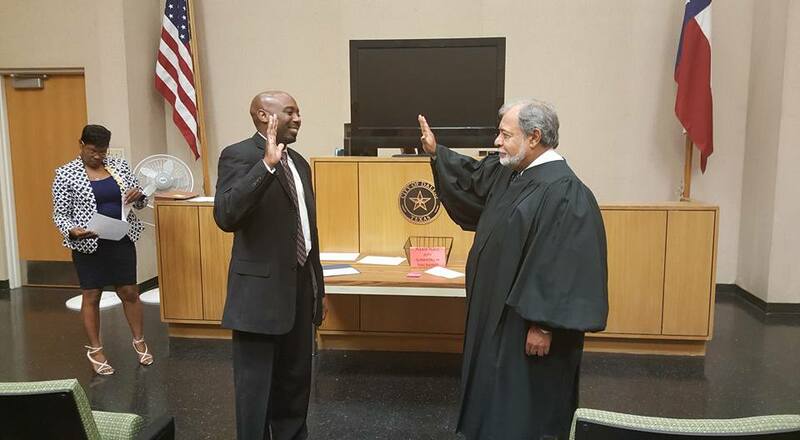 After serving four years in the United States Navy, Judge Cooks received his Bachelor of Science in Criminal Justice at the University of North Texas. He went on to earn his Jurist Doctorate at Baylor University School of Law. Cooks began his legal career as a City Attorney with the City of Dallas where he worked as a prosecutor from December 2008 through 2010. He then explored other legal practices as he moved to The Willis Law Group, a civil defense law firm, to practice insurance defense and workers compensation matters. Looking for his next challenge, he worked for Scheef & Stone where his primary focus was commercial litigation. In February 2015, he opened his own practice, Cooks Law Firm, Pllc, where he handles cases ranging from DWIs, assaults, personal injury to breach of contracts. The Dallas City Council reviewed over 250 applicants for the position before passing their votes on 28 judges. Judge Desmond L. Cooks and father Mark D. Cooks. Cooks said he is also proud that his son has taken the time to visit Duncanville and other schools in the area to encourage students to continue their education. “I’m extremely elated with the short time he spent with me in Duncanville learning about our city and how it works,” Cooks said also adding he is proud of both of his sons and that he and Desmond’s mother, Frances Cooks are very pleased.